STOP THE CARâ¦LETâS SEE THIS ONE! 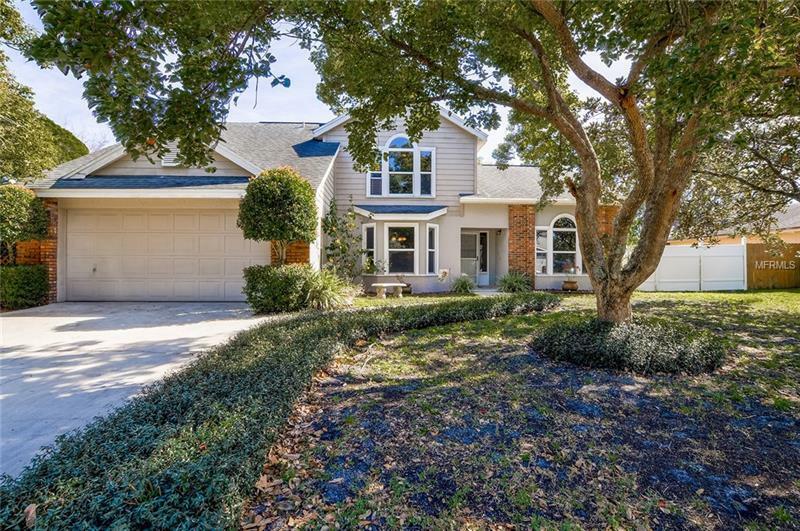 Lovely, move-in ready home in the beautiful established neighborhood of Fox Chase in Oviedo is waiting for YOU! This 4-bedroom, 2.5 bath home boasts a 2-car garage, large screened pool & huge patio as well as a covered lanai w/paver flooring. For basketball enthusiasts there is a large back yard with basketball hoop and concrete âcourt.â New roof being installed prior to closing. Entire first floor is all luxurious travertine tile w/7â baseboards. The downstairs master suite has a fully updated master bath w/granite counter top, travertine shower & large walk-in closet. The remodeled kitchen proudly displays Slate stainless appliances (new range, microwave & dishwasher), granite counters, large stainless-steel sink w/window overlooking pool area, wood cabinets, and huge 36â x 60â island for prep, seating, & storage. Large closet pantry under stairs. Spacious dining room with plenty of space for your large gatherings. Updated half-bath w/granite counter top & vessel sink. Eye-catching stairway and second floor have solid hardwood floors. Three generously sized bedroomsâ¦one with 2 walk-in closetsâ¦an updated full bath with granite counter top, travertine floor and tub/shower, and loft/study/computer area round out the exceptional elements of this very special home. Excellent Seminole County school district. Conveniently located near shopping & restaurants, UCF, employers, & 417 Greenewayâ¦only an hour to beaches or attractions! Sold âAs-Is.â ONE-YEAR HOME WARRANTY INCLUDED! Pet Restrictions: Contact HOA for pet restrictions, if any.